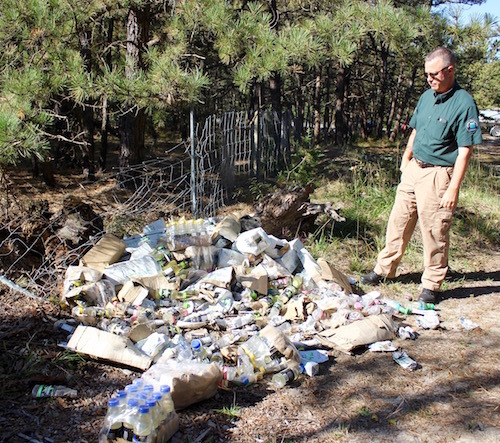 Central Pine Barrens Commission Compliance and Enforcement Officer Mike Lewis with one of the piles of energy drinks in the woods off Speonk-Riverhead Road. A desolate stretch of Speonk-Riverhead Road just off of Sunrise Highway is just one of many hot spots for illegal dumping throughout the central pine barrens, but the Central Pine Barrens Commission is looking to put a stop to that dumping with a simple message: We’re watching you. 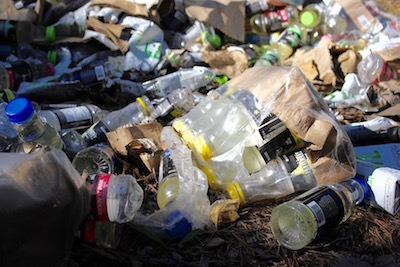 The Commission’s Compliance and Enforcement Division brought charges this week against a Middle Island man who was caught in surveillance in September dumping hundreds of bottles of expired energy drinks in a patch of protected woods owned by New York State. Jon R. Savitt was charged with a misdemeanor count of littering on public property and with operation of a vehicle off-road on public property. He is due in Southampton Town Justice Court on Dec. 8. The bottles were dumped down a dirt path that had once been a cut-through from Sunrise Highway to Speonk-Riverhead Road, which crosses the highway on an overpass, but which doesn’t have an official exit onto Sunrise Highway. The state has cut off the path on both ends with a berm made with mulch, but dumping is still occurring along the path before it reaches the berm. Central Pine Barrens Commission Compliance and Enforcement Officer Mike Lewis, who took the press to view the dumping Wednesday before it was to be cleaned up, said many such dirt paths are dumping hot spots throughout the central pine barrens. Some of the dumped energy drinks. Mr. Lewis, a retired Zone Sergeant with the New York State Police, is one of three Compliance and Enforcement Officers, with nearly a combined 100 years of law enforcement experience, who were hired by the Commission this year to stop dumping and illegal ATV use in the central pine barrens. He began working for the Commission in February. The charges against Mr. Savitt were made after the Compliance and Enforcement Division turned over its surveillance information to State Police Trooper Fabio D. Daino of Troop L Riverside, who “located and obtained an admission from Savitt for the materials Savitt dumped on September 15,” according to a news release from the Central Pine Barrens Commission. Mr. Lewis said this is the first dumping arrest for his unit. The state Department of Transportation will be cleaning up the dump site, and Mr. Savitt will pay for the cleanup, he said. The Commission is urging anyone who has tips about illegal activity in the pine barrens to call their hotline at 1.877.BARRENS, or contact the Compliance and Enforcement Division directly by calling 631.288.1079 or by email at enforcement@pb.state.ny.us.